Today was a good day because I eventually figured out what kind of notebook computer I shall save my money on. Purchase is planed for July/August this year, but still, knowing that there are a lot of interesting notebook models out there on the market, I needed to spend some time online searching for the perfect deal PLUS visiting shops and putting my hands on those machines. The internet reveals a lot of information and customer blabla but it doesn’t give you the feeling, the actual touch, the haptic which is needed if you’re seriously buying a notebook. Ok, maybe if you go for those (older) IBM Thinkpads you’ll never need to worry about things like quality or the keyboard but I’ll won’t be able to afford those ones (sorry Steve), and the new Lenovo N100 series hasn’t yet convinced me. Also, for the same reason I could never settle for a DELL notebook as there’s no chance to actually see them in action (here in Germany) except for what they show online. I wonder how u decided for one nevertheless, Mzeecedric? After about one hour of a very detailed and fussy examination of the various notebook models they had on display (removing the battery, turning the notebooks up and down, checking the display and hinges, overall quality, keyboard + size of keys, etc. ), the supermarket’s security guy approached me and told me NOT to dismantle anything but instead that I should be asking those (bored) salespersons around who’d be willing to assist me… (MEDIA MARKT, are you listening? Hello? I am was a potential customer…pffffff). Other interesting models included in my search (so far) where: Acer Aspire 5652, Asus A6J/V series, Fujitsu-Siemens Pi 1536, HP nx6110, nx6230, nx8220, HP Pavillion dv5165, Samsung x20 series, Toshiba M50 series and the Lenovo N100 series. The advantage with the 5762 is that it includes Bluetooth and a webcam (which can be turned 220° so you can actually take a video of the environment!) 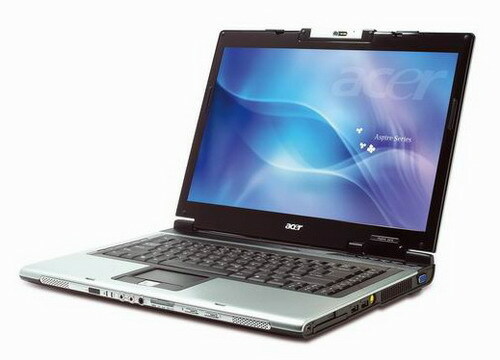 among a variety of interfaces that are normally only offered on more expensive notebooks. However, customers of this relatively new model reported a loud dvd drive + weak battery run time but I think that’s only once you use the pre-installed WinXP with all those redundant little “extra tools” that will run in the background and take up RAM + battery power. Hence my only concern is the slot-in DVD drive which is too prone to dust but I’m sure it can be cleaned (while in Nairobi, I was desperately searching for Isopropyl alcohol which was said to be available – normally – but “just not this time”. Well, surgeon’s alcohol also works if you can live with that smell….). Well, today was a good day because I not only managed to free my brain off this burning desire to settle on a certain notebook (you don’t have to be a Gadgetfreak to understand that feeling – just think of shoes and handbags and you might get the picture :-), but I also eventually realized that I am somehow stupid. 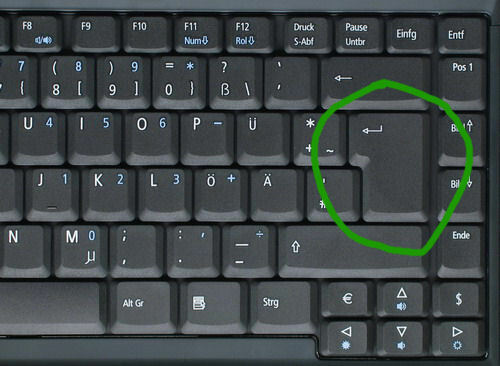 So today I realized that – contrary to what is visible on that international product image from ACER – the German QWERTZ layout of the keyboard actually includes such a big ENTER key – YEAH! Which goes to show once again that the information online isn’t accurate enough and still requires some detailed inspections in shops. Aterere…now I’ve made up my mind on this machine and unless YOU come up with another interesting, affordable (max 1.300,- EUR) alternative/suggestion, I’ll stick to this machine and make it become my main computer in future. Btw, this is the sticker I had planned for the back cover. Customization – here you go! AOB (edit): TOGO, are you N U T S??? There’s this once-every-4-years-chance to play for your country and all these guys can do is talk about money….what a shame! I know what you mean about keyboards! I believe Toshibas have the STUPIDEST keyboards on the planet! The damn things map pair page down/end and page up/home!!!! What, no Thinkpad? Thats it, I have stopped reading your blog . . . But seriously, this is a great chioce for a laptop JKE, most of the features listed here, I still dream about like the card reader, dvd burner, 2.0 Bluetooth and ExpressCard. Can you believe that they still dont have some of this stuff on any Thinkpad (like the multi format cardreader). On the other hand, I have a battery used to go 8.75 hours when it was new . . .
. . . and in the 6 years I have had a Thinkpad, I have never had anything break . . . and I also have that all black look that commands respect. 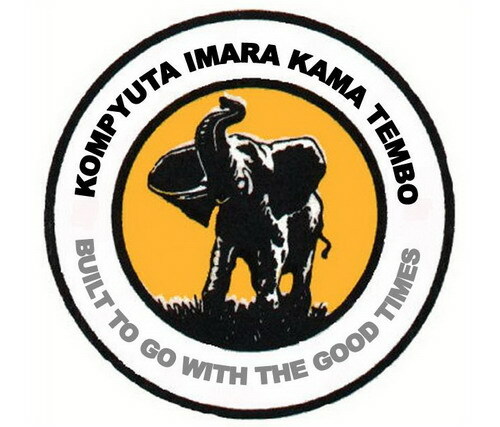 I have to let you know though, the only way I could afford it was by buying a mutumba. If I was buying a laptop today, I probably would buy this one, it represents a nice compromise between cost and features/value.